Bell & Ross, the newly appointed Official Watch Partner for the Jaguar Simola Hillclimb, was the timepiece of choice for the 2018 motoring lifestyle event. “Precision, reliability, functionality and legibility are the Bell & Ross founding principles. Our instruments are made for the professional and perfectly suited for the track. We are proud to share our passion for performance with the Jaguar Simola Hillclimb. The experience in Knysna over the three days of the event has been nothing short of amazing,” says Yushaa Desai, Brand Manager for Bell & Ross South Africa. The action started early on Classic Car Friday with an incredible mix of cars and drivers matched only by the ideal weather conditions. The luxury Bell & Ross Drivers Lounge was located next to the pit lane where the timekeeping log was on view. The anxiety and anticipation in the lounge was tangible as the teams waited on their respective results. The drivers and motoring enthusiasts in the lounge were able to experience the Bell & Ross timepieces as well as the brand’s racing heritage. Saturday saw the introduction of the impressive Bell&Ross Nxgen R35 Nismo GTR driven by renowned South African motoring star Kyle Mitchell. “The experience was something I couldn’t put into words, I was proud to be associated with Bell & Ross and the car was definitely a head turner. Climbing the hill was exhilarating and an adrenaline rush like no other. 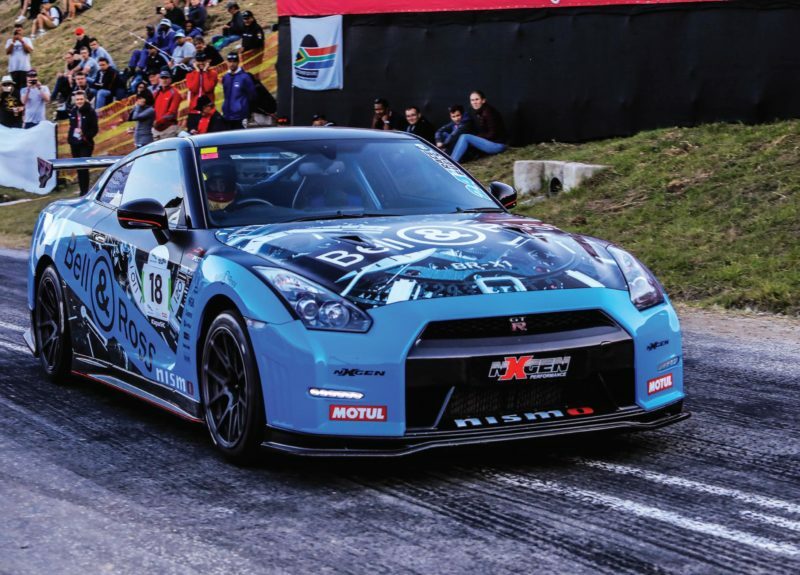 To climb 1.9km in 42 seconds and reaching a top speed of 258km/h is quite a rush especially when there is just a short grass patch then the end of the mountain,” says Mitchell who finished fourth in his class and ninth overall in the only road legal car in the top ten. Local actress, model and Bell & Ross brand ambassador Amanda Du-Pont joined the Bell & Ross team at the Drivers Lounge on Sunday and rounded off the weekend by handing over the winning prize of the Bell & Ross lucky draw to an elated Mr Dave Grobler.